As is the case with, well, pretty much everyone around the world, MARY POPPINS has long been a favorite Disney film of mine. I loved it as a child, shared it with my now-adult daughters, and it's the first live-action Disney movie I shared with my eldest grandson — who was immediately enchanted by the film though not quite three years old at the time. 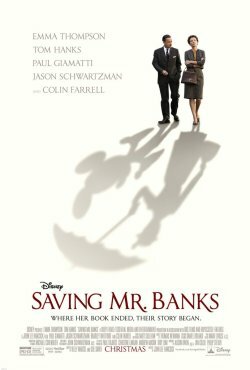 Because of my affection for MARY POPPINS, I looked forward to SAVING MR. BANKS from the moment I'd heard about the film. I had the good fortune of attending an advance screening of the movie last month courtesy Disney Pictures, and my heart has sang its praises ever since. Now that the movie opens soon in theaters — in limited release today, wide release December 20 — I can now put my praises in writing, as well. Though I'd anxiously awaited the movie, I originally was not too thrilled by the prospect of Walt Disney — who had never before been portrayed on film — being played by Tom Hanks. Tom Hanks is a fabulous actor, I admit, but I've always been disappointed to find it impossible to see the characters he plays, as I only see Tom Hanks the Movie Star playing whomever he's portraying. Because of that, Tom Hanks being the star of a movie has long made me more likely to avoid it than embrace it. That changed with SAVING MR. BANKS. I wouldn't say Tom Hanks became Walt Disney for me. He did, though, become someone I was delighted to watch, a mesmerizing actor I'll no longer shy away from. What I loved most about the film: Hands down, it was Emma Thompson. She was incredible. She did become P.L. Travers. She frustrated me, made me laugh, made me weep. Her performance was the very best I've seen in a very long time. It's no surprise at all that she's garnered rave reviews as well as Screen Actors Guild and Golden Globes best actress nominations. And, of course, there's the music. What is a Disney film without music? The background on the music of MARY POPPINS changed many of my ideas on my beloved favorites, lent a more meloncholic feel once the story of them was revealed in SAVING MR. BANKS. 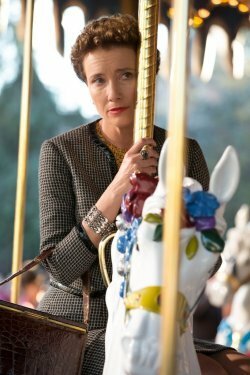 Disney has provided the following special behind-the-scenes look at the music of SAVING MR. BANKS, which is, really, the music of MARY POPPINS. 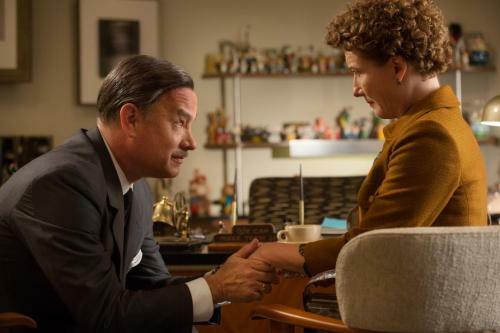 SAVING MR. BANKS is, without a doubt, one of my favorite films of 2013. As Jim, who attended the screening with me, said afterward, we must watch MARY POPPINS again, now that we know the background of the making. I've no doubt we'll see it in an entirely fresh way. I can't wait. SAVING MR. BANKS (rated PG13) also stars Paul Giamatti, Bradley Whitford, Jason Schwartzman and Colin Farrel, and opens in select theaters today and nationwide December 20. Find out more on the SAVING MR. BANKS website and by following on Twitter and Facebook. The SAVING MR. BANKS: The Official Multi-touch Book — created by Apple’s digital book creation app, iBooks Author. is available for free, exclusively on iBooks at www.iTunes.com/SavingMrBanks. Disclosure: I attended a free advance screening of this film, with no obligation. Opinions are my own. What is the first live-action Disney film you recall seeing?